Wheeled weed eaters are unique trimmers which function both as lawn mowers and string trimmers. 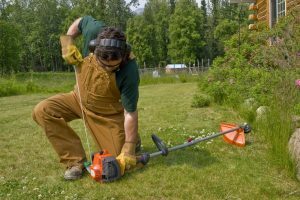 These powerful tools are perfect for trimming tall vegetation and other stubborn weeds, which ordinary string trimmers can’t tackle. 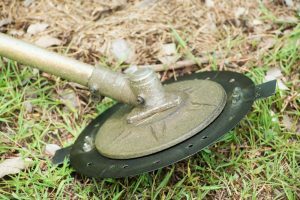 There are a number of reasons that make wheeled string trimmers a good choice for cutting rough bushes. Wheels– the wheels of these trimmers have a large diameter of 12-16”, making them maneuverable on rough terrains. The wheels are made out of hard plastic which means you don’t have to worry about flat tires anymore. Cutting width– unlike string trimmers, which have a small cutting diameter, wheeled weed eaters come with a 22” cutting diameter which is perfect for trimming large fields. All wheeled weed eaters are powered by similar 4-cycle engines. Such engines–like those used by lawn mowers and gas-powered trimmers—require frequent oil changes to keep them smooth. With that in mind, this article will review some of the top wheeled weed eaters in the market. The Remington 22-Inch Trimmer is a user-friendly wheeled trimmer which will clean up your lawn, garden beds and hedges perfectly. 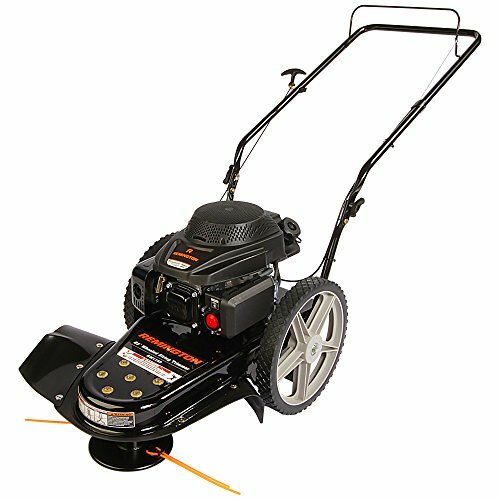 Powered by a unique 159cc 4-cycle engine, this machine is capable of trimming the tallest weeds and rough grasses growing all round your garden beds. The 14” rear wheels provide easy maneuverability around obstacles, reducing the working time. The Remington 22-Inch Trimmer can be adjusted in three positions for an even control when operating. The .155 lines ensure perfect trimming of both weeds and hedges making it an ideal mower for your garden. This trimmer’s dimensions are 34.5×22×21.1 inches and it weighs 78 pounds. This wheeled trimmer has a powerful 159cc 4-cycle engine. It has very strong string lines, which are capable of trimming rough weeds and tall grass. The 14” rear wheels are perfect for maneuvering round rocky terrains when trimming. It has an adjustable frame, making it perfect for both tall and short users. Some customers have criticized the engine, stating that it’s very loud. To conclude, the Remington 22-Inch Trimmer is an ideal solution for people looking to clear weeds and rough bushes from their gardens and lawns. Designed with tough string lines, large rear wheels and a powerful engine, this trimmer can do a lot more than weed eaters and ordinary lawn mowers. Worx is a known manufacturer of quality lawn mowers in the market. The company has acquired a large market share through producing cordless trimmers at an affordable price. Currently, the manufacturer has released a new model known as WORX WG775 Lil’Mo Lawn Mower. An outstanding tool with flexible features, this lawn mower has the capacity to trim a total of 6,000 sq. ft. of lawn with just a single charge. Without using gas, oil or electric cords, this machine uses only its powerful 24-V battery to complete its tasks. Instead of pulling a string to start the engine, this lawn mower only needs you to push a button and everything is ready to go. With a cutting width of 14 inches and an adjustable mowing height of 1.8-3.3 inches, the WORX WG775 Lil’Mo Lawn Mower is what your garden beds need to keep clean and tidy. This lawn mower has comfortable handles which provide an ergonomic grip when trimming. This machine offers a battery runtime of approximately 30 minutes. This is more than enough for trimming a small garden. With a weight of 33 pounds, this trimmer is very easy to manage. With a 3-in-1 performance, this machine can be used for mulching, bagging and rear discharging. The lead acid battery used by this lawn mower is of low quality as compared to Li-Ion batteries used by other cordless models. The wheels are very fragile making them unsuitable for rough ground. The battery has a very short runtime. All in all, the WORX WG775 Lil’Mo Lawn Mower is the best lawn mower for trimming small gardens. It has a powerful 24-V lead acid battery, which offers a longer runtime when trimming. However, the only drawback with this machine is the fragility of the wheels which don’t work well on rough ground. 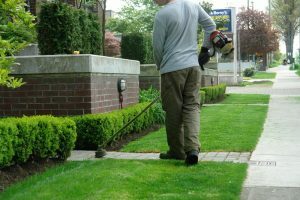 The Earthwise 11-Inch 8.5 Corded Electric Tiller is among the best electric trimmers in the market. Available with a powerful 8.5-Amp motor, this machine has the capacity to trim rough weeds and overgrown bushes with just a push of a button. The dual 4-blade tines offer a cutting width of 11 inches and a depth of 8½ inches. The manufacturer has tried to give the Earthwise 11-Inch 8.5 Corded Electric Tiller a sleek and stylish appearance which appeals to every customer. At just 25 pounds, this trimmer is among the lightest wheeled weed eaters in the market, making it ideal for elderly users. With an 8.5 Amp motor, this trimmer is very powerful as compared to most of its competitors. This trimmer is very affordable making it one of the cheapest wheeled trimmers in the market. It is a very light, at just 27.5 pounds. This is perfect for elderly users who can’t manage bulky mowers. The narrow width means that you’ll have to spend more time trimming your lawn. Its light weight is another problem, as the machine will tend to jump violently when it comes across a hard root or a rock. In conclusion, the Earthwise 11-Inch 8.5 Corded Electric Tiller is a perfect fit for most home gardens and lawns. Although some customers have complained about the light weight and narrow width, let me say that, to some extent, these cons are also pros. What I mean is that the light weight gives you a chance to control the machine while the narrow width helps you trim profile areas where large mowers can’t reach. After a thorough review of some of the top weed eaters on wheels, the Remington 22-Inch Trimmer was the best in the list. This weed eater is powered by a unique 159cc 4-Cycle engine which enables it perform tough duties such as trimming the tallest weeds and rough grasses around your lawn. With 14 inch maneuverable wheels and the ability to self-adjust in three positions, this weed eater is perfect for older users who enjoy trimming duties around their gardens. 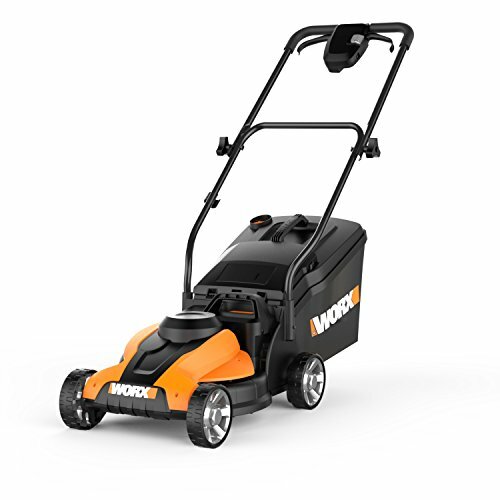 Second in the list, we have the WORX WG775 Lil’Mo Lawn Mower. This machine has the capacity to trim a total of 6,000 sq. ft. of lawn with just a single charge. Without using gas, oil or electric cords, this machine uses only its powerful 24-V battery to complete its tasks. Instead of pulling a string to start the engine, this lawn mower only needs you to push a button and everything is ready to go. With all the smart features at their disposal, this machine is perfect for all property owners looking for style and performance. Last but not least, we reviewed the Earthwise 11-Inch 8.5 Corded Electric Tiller. 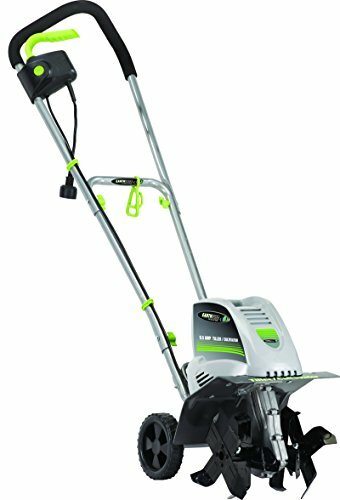 Available with a powerful 8.5-Amp motor, this machine has the capacity to trim rough weeds and overgrown bushes with just a push of a button. The dual 4-blade tines offer a cutting width of 11 inches and a depth of 8½ inches. With a sleek and stylish appearance, this weed eater is the best for users looking for style, class and performance.